Known as Daylily, these flowers are very popular for lining borders in Northern California. They vary in colors and shapes. Once established, they are very drought tolerance, therefore making them terrific additions for conservative watering landscapes. The ones pictured here are deep burgundy, rich and warm, reminding me of the depth of family love. I am sending virtue flowers to my SO's father for his Birthday. At the same time, my prayers goes out to him for fast recovery as he is in intensive care. I could only hope with time and good care he will soon be able to regain the freedom to enjoy his family again. It is during these trying times that we realize how strong family ties are and how it is extremely important in our lives. Love those who love us - more deeply. I didn't know my father very well. While growing up, I hardly saw him. He was always working, or just very reserved. I remembered him most by the drives to school during my first six months in seventh grade. This half hour ride stayed with me most because I had quality time with him, even though we hardly said a word to each other. After the six months, life created more separations between us and we were mostly apart. I lost him to a car accident when I was 21. It was devastating for me because I always thought one day I would have an opportunity to learn more about him and to talk to him as an adult. I didn't have that chance and it bothered me for a long time. Eventually, I accepted that our relationship was not the way I liked it to be, but it was good from what I remembered. Hopefully you are making every effort to get to know your parents, and cherish the time you have with them. Every day is an opportunity, and another less 24 hours we have spent. I don't think I've seen this colour before. It's lovely. Your post made me think, actually. You're fortunate to have good memories (albeit short ones) of your dad. My dad ran off when I was a baby. He left when I needed him most. He's still alive but a relationship is no longer possible. I don't know the man. I would have love to know about my father too, but I didn't have that chance either. Beautiful post, and I hope your SO's father is getting better every day..
Gorgeous shots of such a pretty colors lily! Very gorgeous and deep hues! Great shots! @Anne Lyken-Garner I am sorry to hear about your dad's behavior! Glad to know you turned out beautifully though, yay! @Mumsy Thanks Mumsy, I think that is how it was where I came from, but yes, I see my children now with their father and I wish to have the same type of relationship. @Mary Thanks for visiting Mary. @A Garden of Threads Yes, I loved the Mosaic you did for your son's engagement too, how did you do that. Daylilies are a winner in my garden. Love yours. @Americana Lady Many people might know about it, but not too many can live it Joan. I too hope my SO's father get better soon. Amanda, I hope your SO's father gets well soon and will be able to spend lots of quality time with you and yours. I am sorry you lost your father so young. We need to treasure what we have. My mom is just a few miles away and I see her frequently along with my children/grand children but I was always terrified of my father as a child and our relationship was strained when I became an adult. He passed a few years ago of Alzheimer's, cancer, and Parkinson's. We never were close. Work on your relationship, cherish it. Unusual color in the daylily. They are such great flowers. Hoping for a speedy recovery. Beautiful flowers. Thanks for the reminder and I hope have peace regarding your father. Beautiful flowers for a touching post. Best wishes to your SO's father for his birthday and a speedy recovery. This is a lovely daylily. Nothing beats them for colour in my garden this time of year! 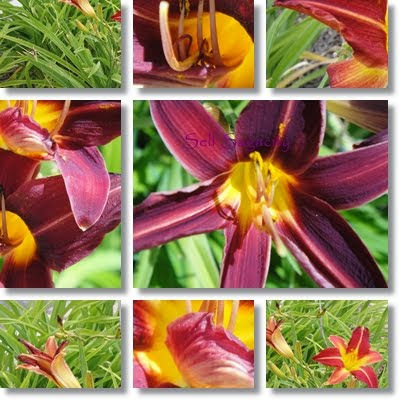 I love the color of this daylily, it is so deep and rich. Your post is very touching Amanda. Wishing your SO's father a very speedy recovery. What lovely flowers and a beautifully thoughtful post. Sending good wishes to you and yours. My front flower garden is overrun with small yellow day-lilies. I do not want to get rid of them, but am not really sure when to dig them up, seperate the bulbs and when to replant them. Makes me want to plant them. This would make my ftont yard so pretty. I'm sorry about your father...I know the longing. I don't know my father. Never had a chance with him at any time in my life...maybe he'll show up. Never knows what God has planned. So true about cherishing our loved ones.